Ernest Hemingway, American Nobel Prize-winning author, was one of the most celebrated and influential literary stylists of the twentieth century. His critical reputation rests solidly upon a small body of exceptional writing, set apart by its style, emotional content, and dramatic intensity of vision. Ernest Miller Hemingway was born in Oak Park, Illinois, on July 21, 1898. His father was a country physician who taught his son hunting and fishing; his mother was a religious woman, active in church affairs, who led her son to play the cello and sing in the choir. Hemingway's early years were spent largely in fighting the feminine influence of his mother while feeding off the influence of his father. He spent the summers with his family in the woods of northern Michigan, where he often accompanied his father on professional calls. The discovery of his father's apparent lack of courage, later depicted in the short story "The Doctor and the Doctor's Wife," and his suicide several years later left the boy with an emotional scar. Despite the intense pleasure Hemingway took from outdoor life and his popularity in high school—where he distinguished himself as a scholar and athlete—he ran away from home twice. However, his first real chance for escape came in 1917, when the United States entered World War I (1914–18; a war in which forces clashed for European control). Eager to serve his country in the war, he volunteered for active service in the infantry (foot soldiers) but was rejected because of eye trouble. Hemingway then enlisted in the Red Cross medical service, driving an ambulance on the Italian front. He was badly wounded in the knee yet carried a wounded man on his back a considerable distance to the aid station. After having over two hundred shell fragments (parts of bullets) removed from his legs and body, Hemingway next enlisted in the Italian infantry, served on the Austrian front until the armistice (truce), and was decorated for bravery by the Italian government. Hemingway soon returned home where he was hailed as a hero. Europe, gave him letters of introduction to Gertrude Stein (1846–1946) and Ezra Pound (1885–1972)—two American writers living in Europe. Hemingway and his bride, Hadley Richardson, journeyed to Paris, where he learned much from these two well-known authors. Despite his lack of money and poor living conditions, these were the happiest years of Hemingway's life, as well as the most artistically productive. In 1923 Hemingway published his first book, Three Stories and Ten Poems. The poems are insignificant, but the stories give strong indication of his emerging genius. With In Our Time (1925) Hemingway drew on his experiences while summering in Michigan to depict the initiation into the world of pain and violence of young Nick Adams, a model for later Hemingway heroes. Hemingway returned to the United States in 1926 with the manuscripts of two novels and several short stories. That May, Scribner's issued Hemingway's second novel, The Sun Also Rises. This novel, the major statement of the "lost generation," describes a group of Americans and Englishmen, all of whom have suffered physically and emotionally during the war. In December 1929 A Farewell to Arms was published. This novel tells the story of a tragic love affair between an American soldier and an English nurse set against the backdrop of war and collapsing world order. It contains a philosophical expression of the Hemingway code that man is basically helpless in a violent age: "The world breaks everyone," reflects the main character, "and afterward many are strong in the broken places. But those that it will not break it kills. It kills the very good and the very gentle and the very brave impartially. If you are none of those you can be sure that it will kill you too, but there will be no special hurry." Hemingway revealed his passionate interest in bull-fighting in Death in the Afternoon (1932), a humorous and unique nonfiction study. Hemingway's African safari in 1934 provided the material for another nonfiction work, The Green Hills of Africa (1935), as well as two of his finest short stories, "The Short Happy Life of Francis Macomber" and "The Snows of Kilimanjaro." In 1940 Hemingway published For Whom the Bell Tolls, his most ambitious novel. A wonderfully clear narrative, it is written in less lyrical and more dramatic prose (nonpoetry writing) than his earlier work. Following the critical and popular success of For Whom the Bell Tolls, Hemingway lapsed into a literary silence that lasted a full decade and was largely the result of his strenuous, frequently reckless, activities during World War II (1939–45; a war in which France, Great Britain, the Soviet Union, and the United States fought against Germany, Italy, and Japan). In 1942, as a Collier's correspondent with the Third Army, he witnessed some of the bloodiest battles in Europe. At this time he received the nickname of "Papa" from his admirers, both military and literary. In 1944 while in London, Hemingway met and soon married Mary Welsh, a Time reporter. His three previous marriages—to Hadley Richardson, mother of one son; to Pauline Pfeiffer, mother of his second and third sons; and to Martha Gelhorn—had all ended in divorce. Following the war, Hemingway and his wife purchased a home, Finca Vig&iacute;a, near Havana, Cuba. In 1952 The Old Man and the Sea was published. A novella (short novel) about an extraordinary battle between a tired old Cuban fisherman and a giant marlin, it was immediately hailed as a masterpiece and was awarded the Pulitzer Prize in 1953. A year later, Hemingway won the Nobel Prize for Literature. Hemingway's declining physical condition and increasingly severe mental problems drastically reduced his literary output in the last years of his life. A journey to Africa planned by the author and his wife in 1954 ended in their plane crash over the Belgian Congo. Hemingway suffered severe burns and internal injuries from which he never fully recovered. Additional strain occurred when the revolutionary Cuban government of Fidel Castro (1926–) forced the Hemingways to leave Finca Vig&iacute;a. After only a few months in their new home in Ketchum, Idaho, Hemingway was admitted to the Mayo Clinic to be treated for hypertension (high blood pressure) and depression, and was later treated with electroshock therapy, a radical therapy where an electric current is sent through the body. Made bitter by an illness that humiliated him physically and impaired his writing, he killed himself with a shotgun on July 2, 1961. Many of Hemingway's unpublished and unfinished works were published after his death. Because of his amazing body of work, and his intense approach to life, Hemingway was arguably one of the most influential American writers of the twentieth century. Baker, Carlos. Ernest Hemingway: A Life Story. New York: Scribner, 1969. Hotchner, A. E. Papa Hemingway: A Personal Memoir. New York: Random House, 1966. Meyers, Jeffrey. Hemingway: A Biography. New York: Harper & Row, 1985. Plath, James. Remembering Ernest Hemingway. Key West, FL: Ketch & Yawl Press, 1999. Reynolds, Michael. Hemingway: The Paris Years. New York: Blackwell, 1989. Voss, Frederick. 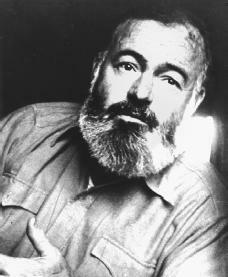 Picturing Hemingway: A Writer in His Time. Washington, DC: New Haven: Yale University Press, 1999.
are there any pictures of his first wife? I would like to see them.